The conversion of the former Graeme Stewart School into upscale apartments marketed as "best in the class" rentals has been controversial. By chance, I stumbled on the latest gentrification fight in Uptown around the time I read Walter Isaacson's essay on the rise of the ride-share and home-share industries in the new economic order. Headlined "Resistance Is Futile," Isaacson's New York Times piece says that change is coming whether you like or not, so either go along with it or get out of the way. In the case of the poor people in gentrifying Uptown, the message is more like Scram! And don't let the door hit you on the way out! Related CPS closed Stewart Elementary School in 2013. Now it’s a luxury apartment building. : A former student goes back to visit. The Uptown controversy has to do with a sign posted outside 4525 N. Kenmore, the building that was formerly Graeme Stewart School. 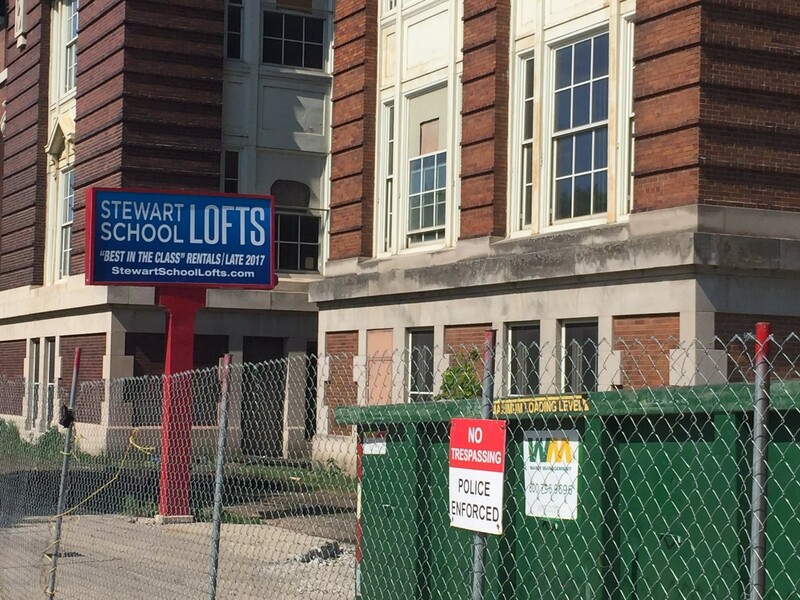 Chicago Public Schools closed the school and sold it to a private developer who's turning it into the Stewart School Lofts, which are being marketed shamelessly on a placard over the school's abandoned playground as "best in the class" rentals. The sign ignited a Twitter debate between Erika Wozniak, a CPS fourth-grade teacher, and 46th Ward alderman James Cappleman, who helped foster the deal that turned a school into an upscale apartment complex. Built in 1905, Stewart was for years a thriving neighborhood grammar school with more than 1,000 students—including, at one point, Harrison Ford. In time, however, enrollment dropped, as many of the surrounding families moved out of Uptown, in large part because of higher rents brought on by gentrification. The newer, wealthier residents either didn't have children or sent the ones they had to private or selective enrollment schools. In 2013, Stewart was one of the 50 schools Mayor Rahm Emanuel closed while he was off skiing on a vacation in Utah (a fact I can't resist repeating). The Stewart students were sent to the nearby Brennemann School, which ironically had been built in the 1960s to handle overcrowding at Stewart. Having closed Stewart, the mayor faced a big decision—what to do with the building? It's the same decision he faced all over the city. Most of those closed schools remain vacant and boarded up, as they're in low-income south- or west-side neighborhoods, where there's little demand for property. It's a different tale on the north side. Morningside Development made the highest of four bids for the building. And in 2015, CPS sold it to Morningside for a little more than $5 million. 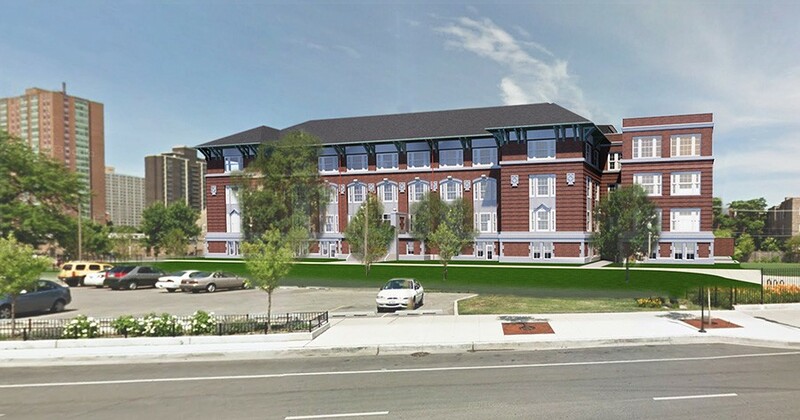 Eventually Morningside announced plans to convert the school into 64 relatively upscale rental units. Morningside is by no means the only developer looking to cash in on converting old schools in gentrifying neighborhood. Svigos Asset Management, a Buffalo Grove-based operation, recently bought the Trumbull School at 5200 N. Ashland for a reported $5.25 million. Svigos has also purchased the buildings that formerly housed Motley School (739 N. Ada), Mulligan School (1855 N. Sheffield), and Peabody School (1444 W. Augusta). All of them have been converted into upscale rental units. In each case, the schools closed after enrollment fell as wealthier residents moved in and working-class people moved out. CPS officials hailed the Stewart sale as a win-win. "This is the fifth former school site we have sold in the past three months," CEO Forrest Claypool said in a press release. "While we still have work to do, I am encouraged that the engagement process is working and expect this positive trend to continue." Not everyone sees it that way, especially Wozniak, who lives in Uptown. "To me, this is Rahm Emanuel's Chicago," she says. "We're closing schools and turning them into private projects and disinvesting in neighborhood kids." What really galled her was that damn sign. "I find that insulting to all the kids who went to Stewart and all the people who worked there," Wozniak says. 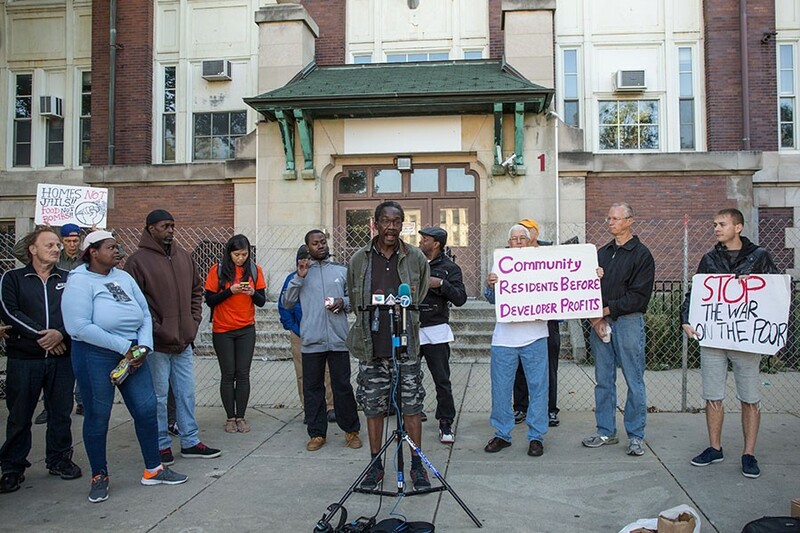 So once again there's no money for our dead-broke schools, but millions for upscale housing. Last week Wozniak vented on Twitter, posting a picture of the sign with the following caption: "This is what is happening to Stewart School, which was closed in 2013. I'm disgusted." To which Cappleman responded: Mika Brzezinski was "bleeding badly from a face-lift." Wait—that's another elected official who likes to tweet. No, Cappleman tweeted: "The school was over ½ empty, had 17 grads in their 8th grade class, needed over $13m to bring it up to code, and CPS facing huge deficit." Wozniak shot back: "Wow. And you used $16 million for JDL developers? Thanks for clarifying where your priorities are." Cappleman responded: "The [JDL] property is now on the tax rolls for the first time since 1939 . . . property tax that CPS desperately needs." The Stewart School Lofts development has ignited community protest. There's a sort of happy ending to the Twitter exchange. Cappleman finally agreed with Wozniak that the sign is "insensitive to the many students and teachers from [Stewart]" and said he'd ask to "have it changed." Correction: This post has been amended to reflect the address of the Stewart School Lofts. The city could face further lawsuits after a judge ruled that a homeless tent city in Uptown was not a protected protest.